When it comes to daytime weekend attire, for me it is defined by two things – it has to look good whilst being uber comfy…kind of like I am still in my PJ’s on the go, but not looking like it! I want a go to effortlessness and for me that is basics with a touch of luxe and added cool that I perhaps I am too lazy to actually possess! 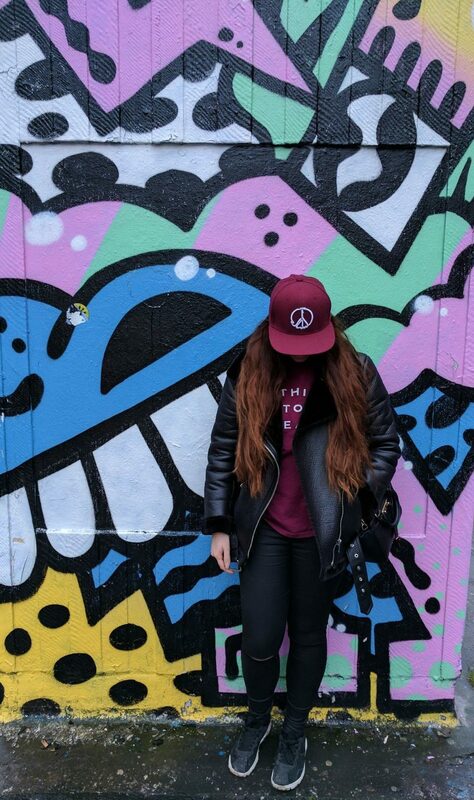 My current obsession is snapback caps (as you might be able to tell from my recent Be Da Bomb OOTD). They make me feel like an off-duty kool kid, when in reality it is hiding a multitude of “bad hair day-ness” underneath. 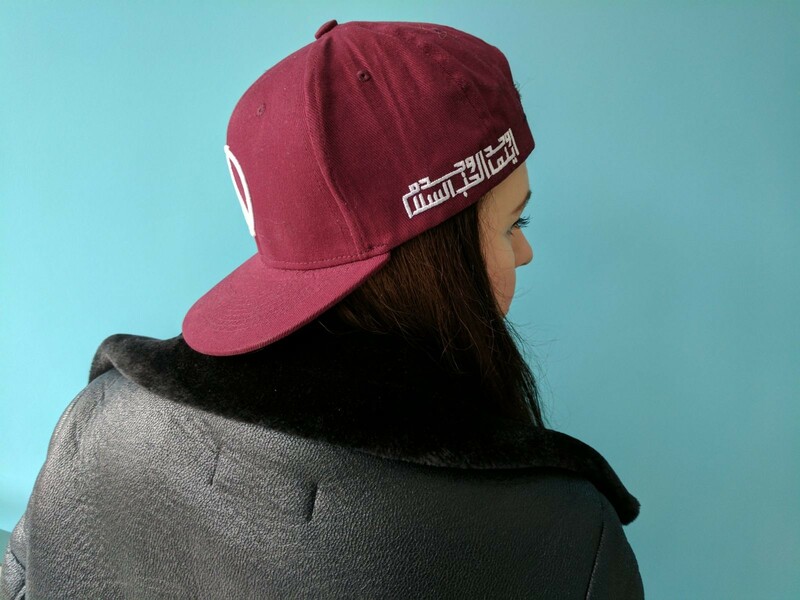 What I love about my latest addition to my snapback wardrobe (yup, I am getting to the stage it has become a genre in my closet) is the feel good inscription in arabic on the side of my A’Salaam cap. Translated it means “Where there is Love, there is Peace” and I felt this was the perfect partner for a day out with my boyfriend. Whenever I am with him I feel at peace and when he is not around, I can think of this affirmation to bring back my oft wandering zen and calm. 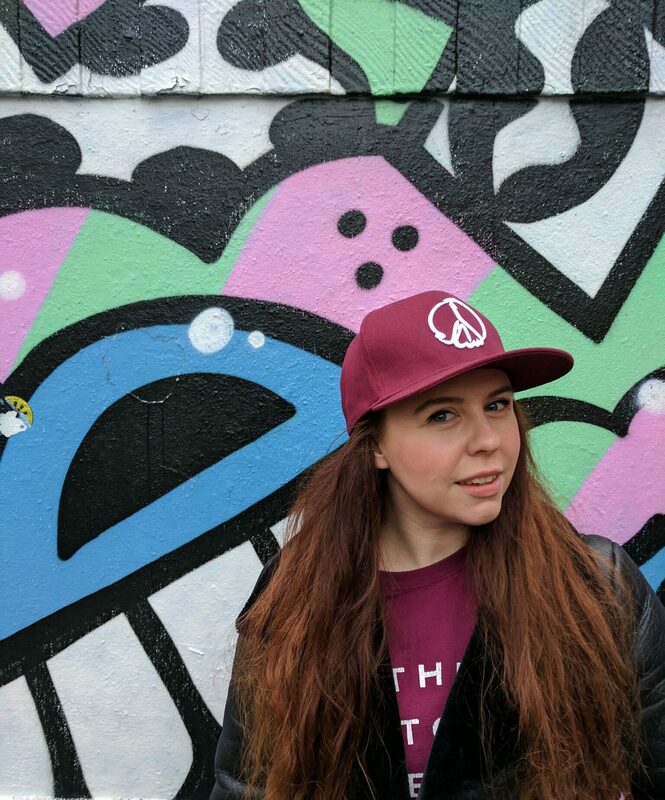 Speaking of calm, the weather this particular day in “sunny” Manchester was actually anything but as Storm Doris was raising her sassy head!So protecting my bonce with a cap was probably the best idea I had that day. That being said, getting out and about in a brisk breeze can blow away the cobwebs of the week, so that you can start afresh. 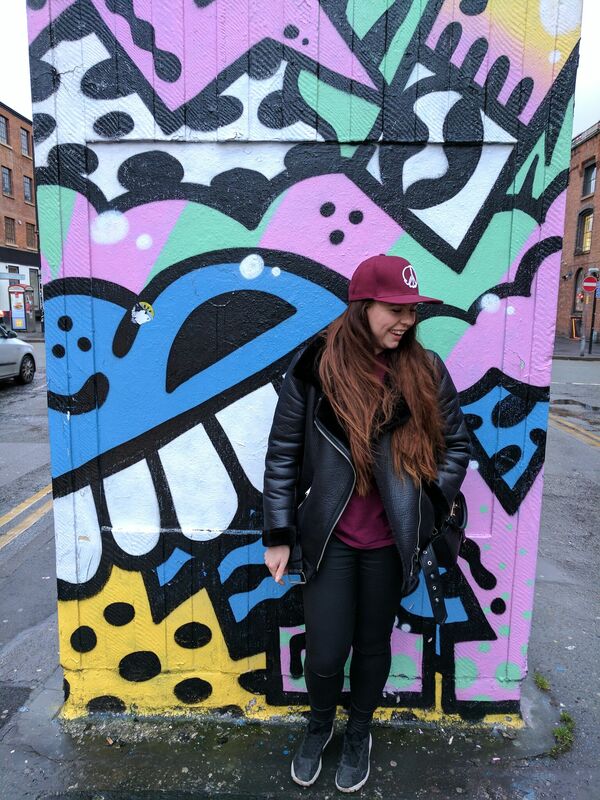 It was time to throw caution to the wind (literally), throw on my fave oversized aviator and go discover some of Manchester’s hidden gems! 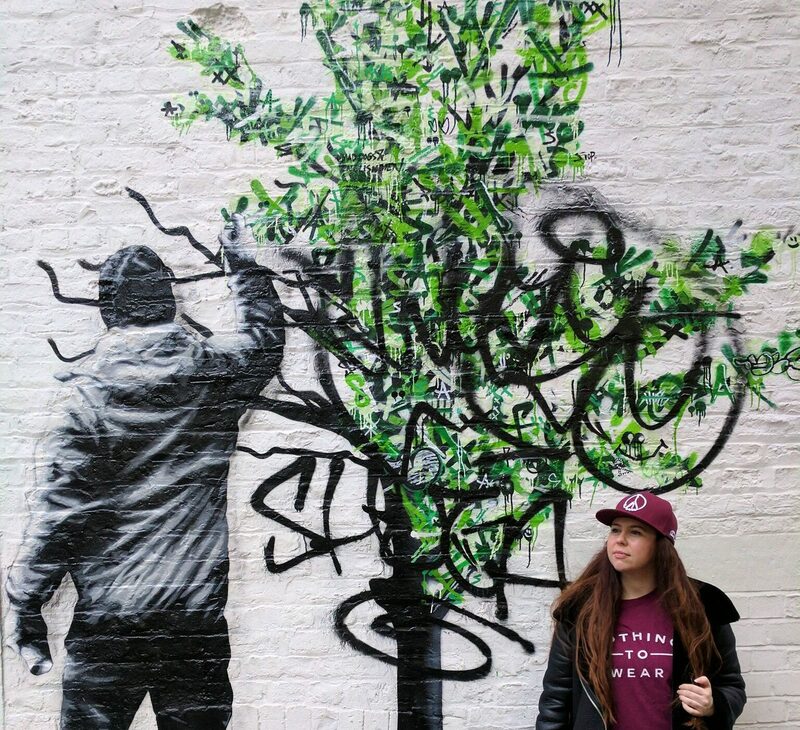 One of my favourite things to do when I am in Manchester is to hunt out the new street art. Take yourself for a meander around the Northern Quarter and there is literally a delight to be found around every corner! The Northern Quarter is possibly (probably actually) my favourite area of the city due to its colour, its vibe…and its eateries. 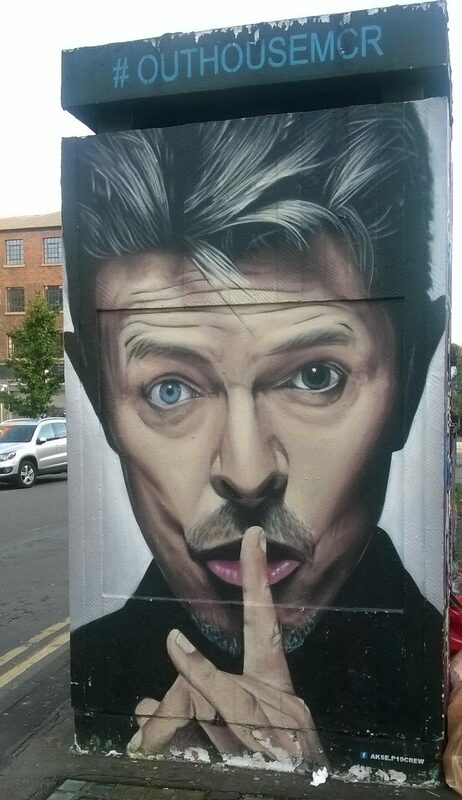 The most iconic piece of street art at the moment in the area has to be the David Bowie mural. Whenever I walk through the area, I am forever seeing people stop to take a moment, take a picture and take in what a great painting it is. I always try to stop a second to look at it as I take it as a visual reminder that there needs to be more peace and silence in my life, from the great man himself. In stark contrast, one of my other top picks is THIS riot of colour below! Bright popping colours swirled together just make my heart happy…plus this looks freaking awesome too! I love that this and the Bowie mural as right at the hub of the area, showing how important street art is valued as a positive thing, not a menace to society as some see it. I think it makes the place vibrant, fun and a pleasure to spend time in. What I love about a good adventure is going off the beaten track, finding the quiet places…and sometimes you will find beauty. Whilst taking a short cut we discovered this little beauty that I think summed up the mood of the day. Peaceful, hopeful and a little bit of a rebellion against the manic nature of everyday life by splashing some much needed beauty about. P.S. Want the latest and greatest FDJ LDN posts straight to your inbox? Then you’d better join the mailing list! Click the “Subscribe” button at the top right of the page and…BOOM! FDJ LDN posts will be delivered straight to your Inbox! You can also follow us on Bloglovin’. Social media filly? Then get to following us on Twitter, Instagram and Facebook. 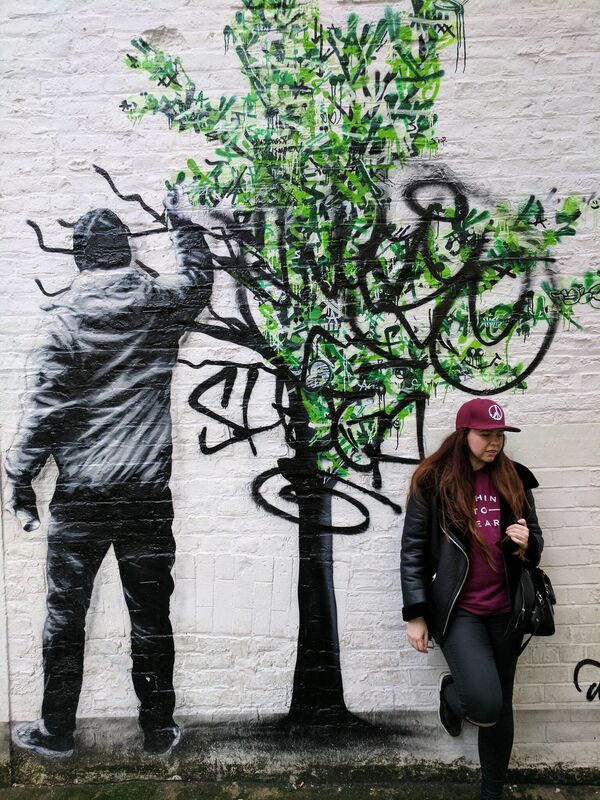 Great backdrops – I never knew about the street art in Manchester! Usually when I go I am focused on shopping hahaha!! Love how you have styled the jacket and that hat is such a great colour. Love the Manchester Northern Quarter. The street is awesome. What a cool thing to do. 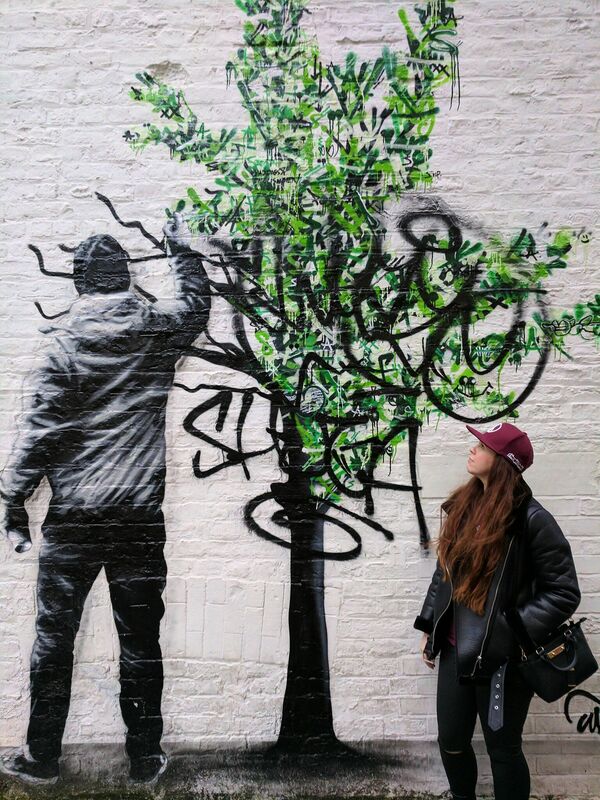 I’ve never gone on the hunt for street art but it must be so exciting to stumble across! What a fab backdrop for your outfit photos! 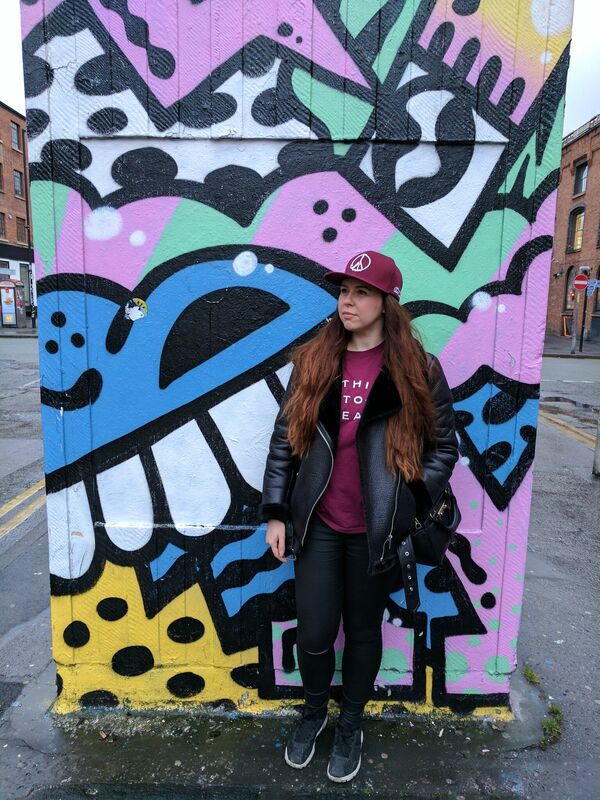 I love street art 🙂 I’ve not been to Manchester in ages, need to visit soon I think! 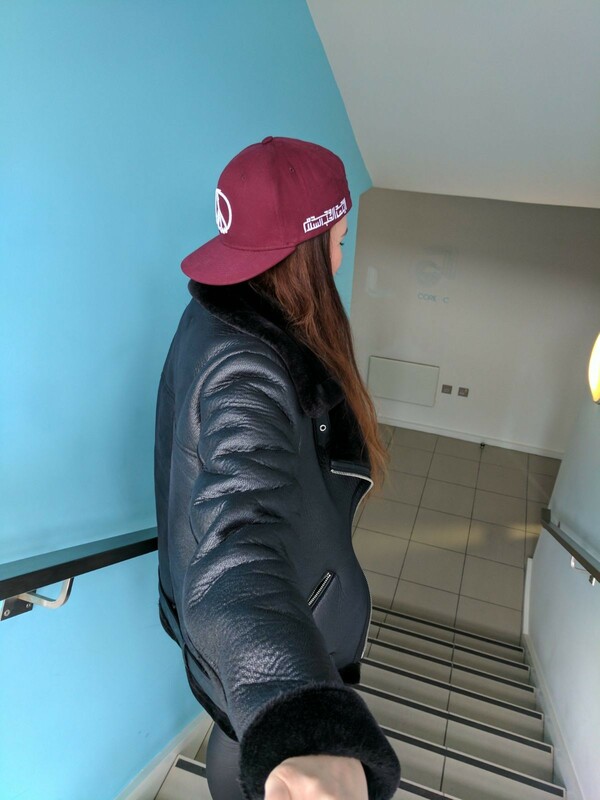 I love the cap, and your jacket too! I’m always in search of cool picture-worthy street out when I’m in the city! You look amazing! That David Bowie mural is crazy awesome! I love seeing street art. I’ve never been to the Northen Quarter in Manchester so I’ll have to make sure I go, I’d love to see that David Bowie murial for myself! Your jacket is lovely. It looks so cosy and I bet it goes with all your outfits! Northern quarter is amazing, really should go there more often for photos. Great post, my daughter needs to move up from Vans and this looks like something she’d love. The street art in Manchester is amazing but living here I forget to make the most of it and just dash past it to wherever I need to be. Love that David Bowie painting, street art is so much fun.